This 4-outlet power surge strip offers the added convenience of two 3.4A USB ports for fast charging of your mobile devices. 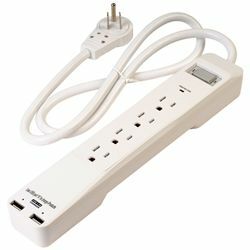 The power strip has a 3-foot cord and a 360-degree rotating plug. The green LED light lets you know the unit is working properly.